The first live shows of THE VOICE season 6 had a special kind of mishap: Team Shakira’s Kristen Merlin’s mike went out during a crucial portion of her song. THE VOICE tapped OneRepublic front man/song writer Ryan Tedder, and his frequent collaborator Noel Zancanella, to write a song to become the show winner’s first single — but in order for the single to be ready in time for the finale, the songwriters wouldn’t actually know which contestant would be singing their song/who they should be writing it for. THE VOICE’s Team Adam is the only one left intact — and is currently comprising of half of the remaining season 5 contestants. THE VOICE coach Adam Levine has had a big week: not only did his entire team make it safely through to the top 8, but he was also named People Magazine’s “Sexiest Man Alive”…something THE VOICE host Carson Daly announced live during the show. We’re down to THE VOICE’s top 8, and as of now, Team Adam is one of two teams that has yet to have an elimination since the voting went out to the viewers. 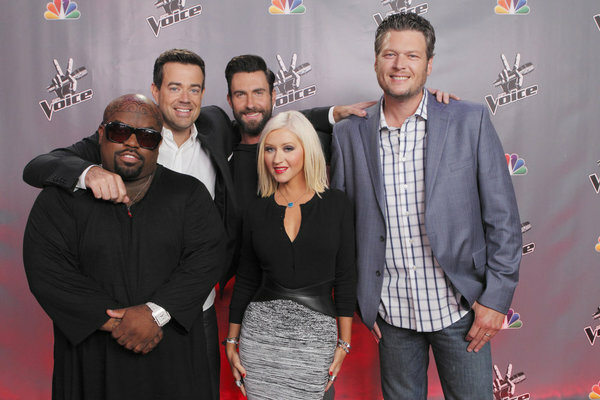 For THE VOICE top 12, it’s now in the hands of the viewers to decide who moves forward.